I’m using an Exchange account and upon opening Outlook it says “Updating this folder”. After a while it changes to “This folder is up to date” and then to “All folders are up to date”. Sometimes it also indicates which folder it is working on but not always. Is there any way to find out which folder Outlook is synchronizing right now? When it is not, it usually is synching additional mailbox information and data such as the folder hierarchy, Views or Quick Steps. It also only displays “This folder is up to date.” or “Waiting to update this folder.” when it is building a connection or halting a current sync. The Status Bar reports the current synching status of your Exchange Mailbox. To monitor Outlook’s synching processing more closely, you can open the Microsoft Exchange Connection Status dialog. 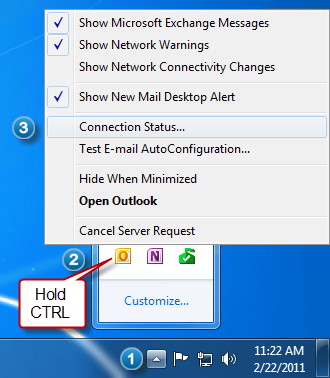 To do this, hold CTRL when clicking on the Outlook icon in the Notification Area and then select Connection Status… The sync activity is shown on the “Local Mailbox” tab. The Microsoft Exchange Connection Status reveals more about Outlook’s current synching process. Aside from reporting the synching other than folders, you’ll often also see here how the synching for a specific folder is progressing in percentages.